I had heaps of fun with DI stains with this card. The colours are vibrant Wild Honey, Fire Brick Red and Aged Mahogany. The timepiece is cut out from a paper sheet, inked and covered in modge podge. It is then layered onto a circle of black cardstock which has been edged in 2 embossing powders ….I did this just to see what would happen and the effect is stunning… gold first, then chocolate sparkle on top. The choc sparkle melts into the gold one! Beautiful. The corner piece is inked in the same colours scrunched, overstamped with an ornament stamp and highlighted with a gold leaf pen just gently swiped over the creases. The checker bits are just cut out of a papers sheet and edged in Aged Mahogany to blend in. The stamps are TH birds and Faith Bird from Stamp It, and just inked in black ink. There is some script stamping over the background in wild honey. Oh, and the wings are from a dance sheet that I got from Artistic Stamper ( and designed by ArtyJen). Shelley’s Images – Show Us What You Got! I see you have been creating fabulous things whilst I have been away. I love this time piece and your hand made flowers are gorgeous. fabulous! love it Thanks for playing along with Stampinsanity! Oh, that's a fantastic piece, love the background. now this just WOWs me – thanks so much for sharing your details – really turned out awesome! Fab card!! 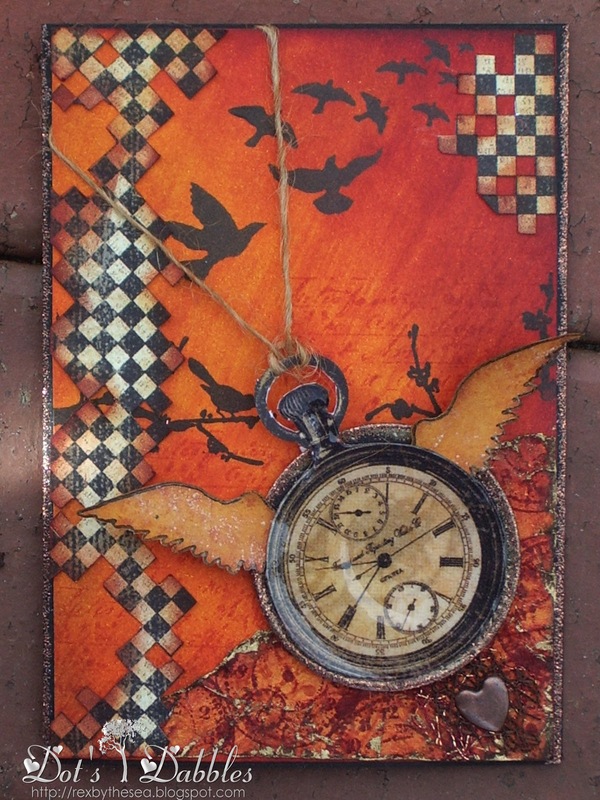 I loved the colors and all the details, like the wings on the clock…time really DO fly!! What a great masculine card. Love the colors! Thanks for playing along with us this week at Speedy the Cat's Friends challenge! wowzers!!! that looks like a real watch with the way you have done it!!! Lovely! Thank you for joining us at StampInsanity this week! Your steampunk card is amazing. I have not tried this style yet, but I am loving it and you are such an inspiration to make me want to explore!!! lol I am intrigued with your explanation of the gold and chocolate embossing powder. It sounds awesome. This is one creative card-I love it! Thank you so much for playing in Speedy's Friends Challenge. It is a pleasure to visit to see your work. Hope you can play with us again next week. Fabulous! I love it! Thanks for playing along over at Frosted Designs. Hi Dot this is fabulous and what's Hodge Podge it sounds adorable? The timepiece is a brilliant piece as the focal point and a fabulous idea with the string. Sorry, typo above.."Mod Podge" ~ a dimensional magic product that adds depth to an image…can be cracked if you like, but I left it smooth this time…looks like glass. I guess it is a shortcut version of using UTEE??? Your card is gorgeous! I love the color combo and especially the wings on that clock. Time really does fly! Stunning piece of work. Love the vibrant colours and the timepiece looks fantastic. Wow! I love the red tones! Mr. Umbrella Man is one of my favorites! This card is FANTASTIC! The colors, the image, the clock, all perfect. WOW! Neat art, Dot! I like the "time flies" theme, and the warm colors of the background. THanks for playing with Speedy's Friends and for leaving some love at my own little blog! Great card. It's got a touch of 'Alice in Wonderland' about it.Thanks also for sharing how you did it! I have now become a Follower! !